If you're creating your first mix and don't know where to begin, or your mixes aren't as good as you'd like them to be, Audio Mixing Boot Camp is here to help. 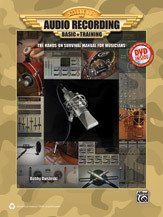 Built around a series of hands-on mixing exercises designed to show you how to listen and work like a pro, best-selling author Bobby Owsinski reveals the tips, tricks, and secrets to all the different facets of mixing, including instrument and vocal balance, panning, compression, EQ, reverb, delay, and making your mix as interesting as possible. You'll cut years off the time usually needed to become proficient in the art of mixing with this book, which is specifically designed to accelerate learning. See how the pros handle the critical balance between the bass and drums. Learn where, when, why, and how EQ should be used on virtually any instrument. Become proficient at using effects in just the right way for each particular mixing situation. And master the key to fat and punchy sounding mixes: compression. 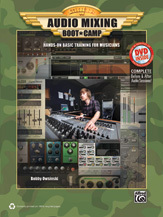 Audio Mixing Boot Camp also features an accompanying DVD-ROM filled with lessons, templates, and examples specifically developed to take your mixing chops to the next level. Title: Exercise Pod -- Am I Finished Yet? Title: How Long Should My Mix Take? Title: How Much Compression Do I Need? Title: Stay Away from Hypercompression!